Section 98 has an identical provision for coincidence evidence. Section 99 of the Act states that notices given under section 97 or 98 are to be given in accordance with any regulations or rules of court made for the purposes of this section. The relevant regulations are the Evidence Regulations 2009. Unlike notices relating to fingerprints or prior convictions there is no standard form provided in the Regulations for giving notice of tendency or coincidence evidence. Instead, there's a list of things that the notice must contain. (iii) in a civil proceeding, the address of each person named under subparagraph (ii), so far as they are known to the notifying party. The Magistrates' Court has no specific directions regarding notice of the introduction of tendency or coincidence evidence. The County Court's Practice Note is here (specifically pages 13, 15 and 30) and Supreme Court Practice Note No 4 of 2010 is here. On the final page of the Supreme Court's practice note there is an example of a notice, but its format doesn't seem intended to be rigidly prescriptive. Given the almost endless variety of circumstances that might give rise to the desire to adduce tendency or coincidence evidence, a fill-in-the-blanks pro forma probably wouldn't work. Some notices can probably state their basis succinctly in two lines, while others may run on for dozens of pages. Case law seems divided on how much detail has to be included in the notice, and how much the party seeking to adduce the evidence will be committed to what was stated in the notice. 14 It is not submitted to us that had those statements been incorporated in the notice itself, there would have been insufficient compliance with the requirements of [the regulations]. As I understand the appellant's argument, it is that [the relevant regulation] requires that material to be contained in the notice and it is not sufficient compliance if reference is made to another document of whatever form, however provided, and even if it were attached to the notice itself. I am unable to accept this argument. It would represent a triumph of form over substance and a triumph which could not fail but to bring the administration of justice into disrepute. 15 I consider that it is sufficiently compliant with the regulation if the notice states, either in its own body or by reference to documents readily identifiable, the nature and substance of the evidence sought to be tendered. Whether or not that narrative does give the substance of the evidence is a second matter to be considered and, of course, a notice which failed to do so, whether by narrative in the body of the document or a document to which it refers, would not comply with the regulation and the evidence, in my view, would then not be given unless the corrective provisions of the Evidence Act were enlivened. The statements are not before us but it is reasonable to infer that the evidence given in the trial as to those other matters reflected what was in those statements. If so, it seems to me that they were sufficiently specific to comply with the regulation. I would therefore reject the appellant's argument in so far as it depends upon the form of the notice. Courts may waive the requirement to give notice under s 100, making arguments about compliance or non-compliance redundant. Whether notice will be waived depends primarily on the nature and extent of prejudice caused to the other party by the applicant's failure to give notice: Regina v Harker  NSWCCA 427. Where waiver is declined, an applicant (usually the prosecution, but it's important to remember that an accused can rely on tendency and coincidence evidence, too) will almost inevitably argue that a fair remedy is an adjournment to allow correct notice to be served, rather than the exclusion of the evidence. Unfortunately the Vic Court of Appeal doesn't seem very interested in considering potntial prejudice to the accused by surprise applications (or the application of the Human Rights Charter either). In Darmody  VSCA 41 the prosecution failed to give the required notice of hearsay evidence but it was still allowed in. 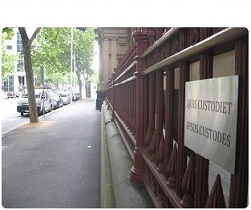 Vic Courts even more than their NSW counterparts are putting their perception of the community's interest (ie. conviction) ahead of a fair trial.